In healthcare, we have oceans of data but only puddles of useful information. The data comes in various forms, typically from healthcare providers who care for us and from the insurance vendors who enroll and cover us. Without question, the data generated within our healthcare system is abundantly voluminous. During the last year, I have spent time writing and presenting about preventable medical errors. I recently was asked by two individuals (one representing the insurance industry and the other employed within the healthcare provider community) to render a guess about specific medical error data within Iowa borders – relating to the number of patients who were lethally harmed. I assured them that I could not find anything local – only national estimates were available. With this said, national patient safety experts, such as Dr. Ashish K. Jha, Dr. Peter Pronovost, Dr. Don Berwick and Rosemary Gibson, among many others, confirm that patients harmed in our country is nothing short of a national epidemic. In a strange way, this request was similar to the Wizard of Oz being asked to provide a heart, brain and invoke courage. But in this particular case, I was asked to unearth local data about the medical errors found in Iowa. I suspect not even the Wizard could provide this treasure trove of critical public information! But, out of curiosity, what IF we backed into these numbers using national estimates? After all, national data on medical errors are estimations that emanate from available (but imperfect) empirical knowledge. Yes, many types of national and local organizations are working diligently to make our healthcare delivery system safer. But until we have a true measurement on the actual prevalence of medical errors to serve as a starting point on a local and national basis, how can we possibly improve or assume progress is being made? For example, are we measuring ‘process’ rather than ‘outcomes’? Are study methods rigorously evaluating improved care in a transparent way? To legitimately improve quality outcomes, we must measure what matters most, not just what is most convenient. Easier said than done, but many times we confuse activity with progress, which only prolongs egregious results. From information found in past studies, reports and evidence, we do know that about 25 percent of all patients are harmed in our country by medical mistakes. The Institute For Healthcare Improvement estimated 15 million medical mistakes occur in our hospitals each year. In 1999, the Institute of Medicine (IOM) released ‘To Err is Human,’ suggesting that perhaps as many as 98,000 Americans die in our hospitals each year as a result of preventable medical errors. In 2013, another report was published in the Journal of Patient Safety conveying that up to 440,000 Americans die in our hospitals due to these mistakes. So which number is most accurate – 98,000 or 440,000? We simply don’t know. Dr. Lucian Leape, a physician and professor at Harvard School of Public Health and a pioneer on patient safety, was a key contributor to the IOM estimates. Dr. Leape has since acknowledged the 440,000 estimate is more likely to be accurate. Using federal and state data from the Kaiser Family Foundation website, total hospital admissions in the U.S. during 2012 was 34.8 million. Of this, Iowa had about 340,000 total facility admissions, a number substantiated by Iowa Hospital Facts. 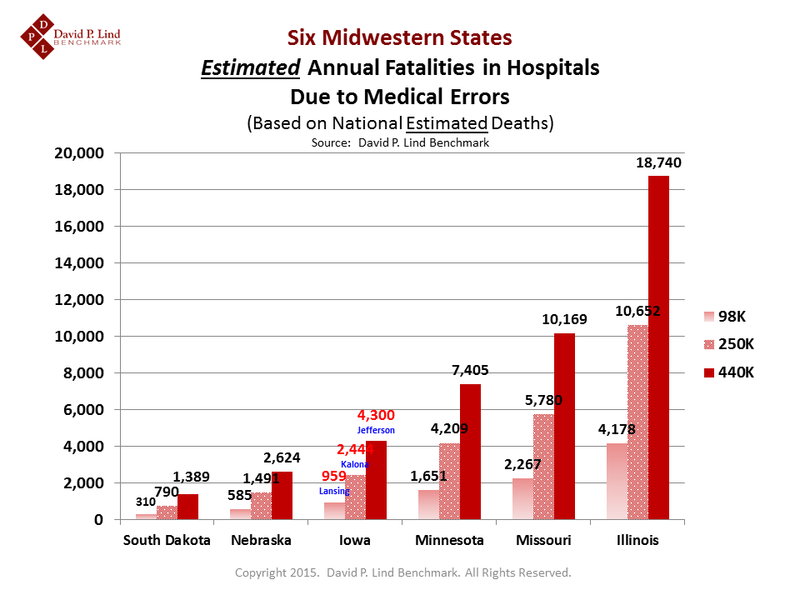 The slide below illustrates the estimated number of medical error fatalities for Iowa and five neighboring states, using the three national estimates. When factoring the 98,000 fatalities as reported by the IOM, Iowa would have an estimated 959 lives lost annually within our hospitals due to preventable medical errors. This number is similar to the population of the city of Lansing, Iowa. If national fatalities are about 250,000 lives annually, a calculation of 2,444 patients die annually within Iowa, or about the size of the city of Kalona. Finally, the 440,000 estimate equates to about 4,300 Iowans dying annually due to hospital medical errors – roughly the size of the city of Jefferson. Within the slide, due to the larger populations of Minnesota, Missouri and Illinois, Iowa compares favorably with lower-estimated fatalities. However, the estimated fatality numbers found in Iowa are greater than those found in the less-populated states of Nebraska and South Dakota. If any of the guesstimates are correct in the next 10 years, Lansing becomes the size of Norwalk, Kalona the size of Marshalltown and Jefferson the size of Ankeny. 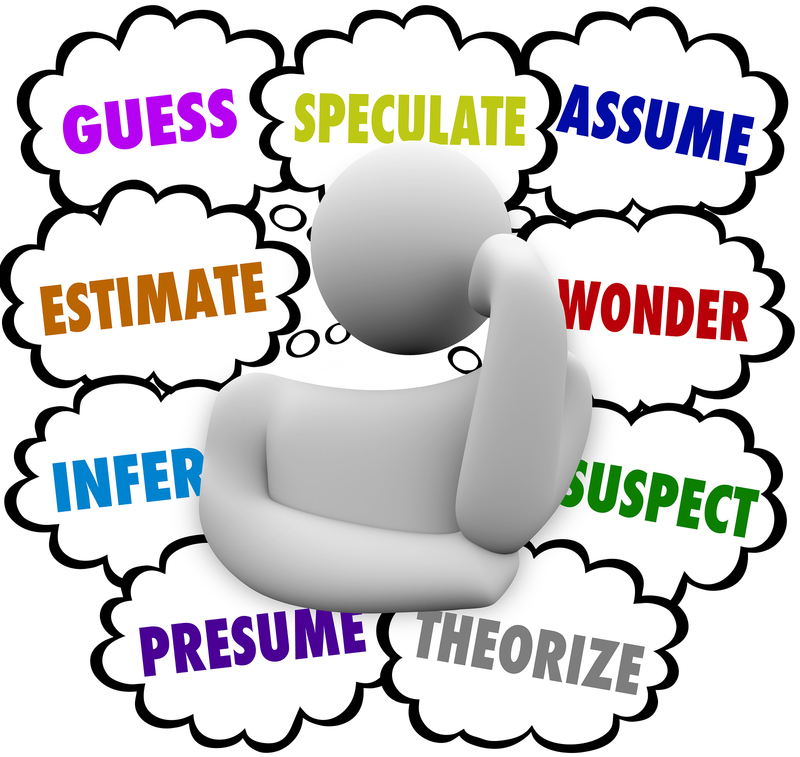 Isn’t it time to start reporting, measuring and documenting ‘actual’ data and stop guessing and theorizing? 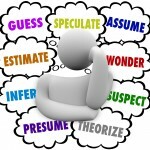 Unfortunately, we live with faceless statistics when it comes to medical errors. Bob Dylan had it right. How many more lives have to be lost before we do the right thing? *CAUTIONARY NOTE: Using the same national factor for every state assumes that outcomes from each state are equal to one another, which is a BIG assumption. Thanks largely to the Dartmouth Atlas of Health Care, we do know that care-quality varies wildly in different parts of our country, state and even across town. Healthcare, like politics, is all local, but we don’t know whether using a national norm is better or worse than the Iowa ‘norm’ because fatality metrics due to medical errors within each state are elusive. Therefore, quality-adjusted care was not baked into these estimates. These are scary estimates David. Thank you for sharing. You are right, it is time for greater transparency.